Edinburgh Airport was Scotland’s busiest airport in 2016 and flies to 147 destination airports worldwide. It suffered a fairly average number of delays but was guilty of cancelling more than its fair share of flights in 2016. We will help to uphold your rights if you were subjected to disruption when flying out of Edinburgh airport, by levelling the playing field between you and the responsible airline. You can quickly establish whether you have a claim by using our free online calculator, after which you can submit a claim with us online. Here are some further details regarding your passenger rights and the EU legislation. Essential: Don’t accept excuses! Vouchers for food, hotels etc don’t relieve the airline of their responsibility to pay your compensation. 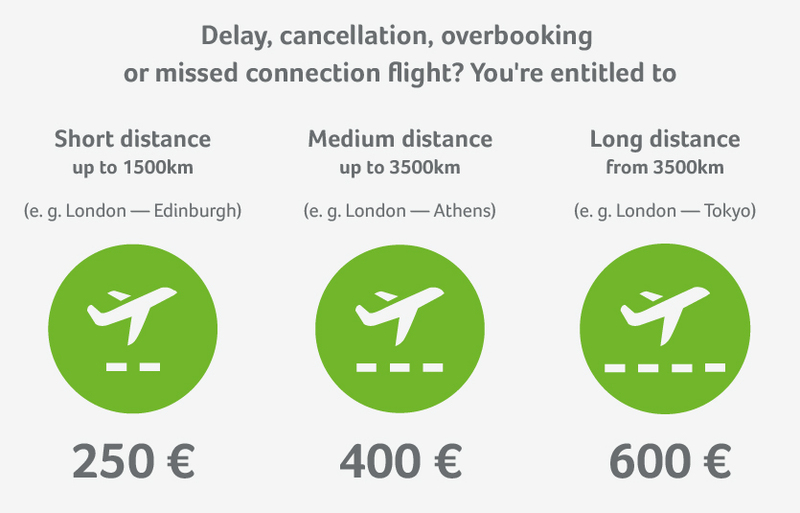 Regardless of the distance of your flight, if the delay reaches 5 hours you are entitled to cancel it. The airline is obliged to either reimburse you the costs or offer you alternative transportation. You’re eligible for a hotel stay, including transport to and from the airport and the hotel, should your flight be postponed until the day after it was scheduled to depart. Address the airline directly and ask for written commitment for your hotel stay and transfer. Our expertise enables us to enforce compensation with a very high success rate. That’s why we are able to promise a completely free service should your case prove unsuccessful! In 2016 some 12.3 million passengers passed through Edinburgh Airport, which connected to a total of 147 airports worldwide. The three most popular routes were to London’s Heathrow, Gatwick and Stansted. This airport can be accessed by road, tram or train. 2016 proved to be a mixed year for punctuality for flights leaving Edinburgh Airport. They suffered 145,000 delay minutes, which is about average considering their passenger numbers. The problem is that they also had to cancel 214 flights outright. These figures leave them slightly worse than average in the UK airport punctuality rankings. You can access free wifi at Edinburgh airport for up to two hours. Additionally there are paid internet terminals at which you login to a PC. These terminals accept Pound Sterling and Euros. If strikes lead to delays or cancellations, unfortunately, you have no compensatory claims against the airlines as strikes are judged to be an ‘exceptional circumstance’. Nevertheless, you’ll be able to make use of some services and benefits at the airport and your airline may provide alternative transportation depending on the circumstances. More information about Edinburgh Airport can be found on their website.